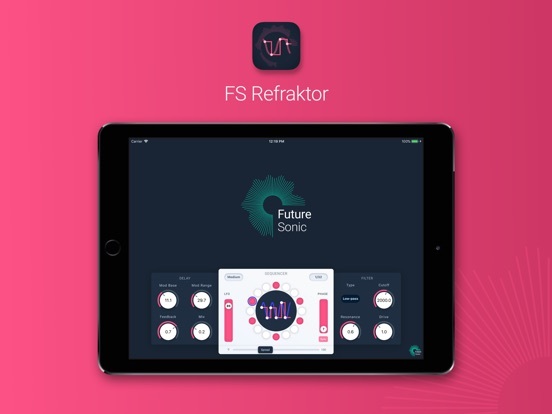 Today Future Sonic has released their third AUv3 effect, FS Refraktor. This modulation effect is intended for musicians who want to explore new sonic textures and territory. They describe FS Refraktor as, "sitting somewhere between a delay and a flanger." FS Refraktor is an innovative twist on modulation effects, inspiring the exploration of new sonic territory. Sitting somewhere between a delay and a flanger, FS Refraktor offers endless possibilities, from rhythmic flanging to chaotic pitch modulation and unpredictable stuttering. The highly flexible sixteen step sequencer and LFO rhythmically warp sounds beyond recognition - standard drums beats become bleeping basslines and synths gain a mind of their own, generating melodies from thin air. The sequencer’s Slew control varies the speed at which the delay time changes - low settings produce sudden jarring variations while higher settings transition smoothly between delay times. Bypass the sequencer, and FS Refraktor will add metallic overtones and strange resonances to your sounds, similar to a short, reflective reverb. - Slew control to vary the speed of delay time changes. - Stereo spread control for creating wide out of phase sounds. There is a short official demo for this one, but fortuitously Matthew Fecher just interviewed Future Sonic CEO Dave Gibson on the latest episode of Audio App Interview. They discuss what it takes to code AUv3 plugins, as well as the inspiration behind FS Refraktor.